Buy this product Renewed and save $2.28. 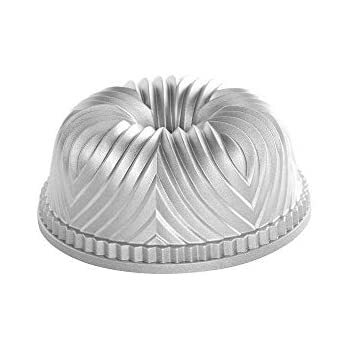 Crisp, clean geometric patterns decorate the Bavaria Bundt pan making it a beautiful addition at any table. 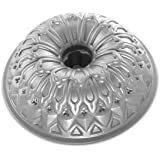 Made by Nordic Ware, the cast-aluminum pan is able to provide sharp detail on every cake you bake. Interior nonstick coating makes for easy release and cleanup time after time. Proudly made in the USA by Nordic Ware. 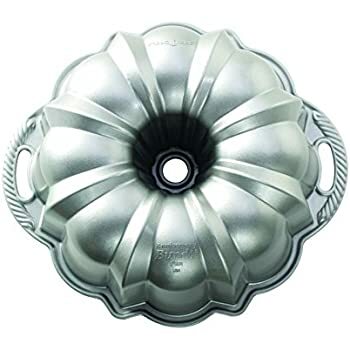 Made of heavy cast aluminum for excellent heat conductivity, this ornately bundt pan is ideal for baking festive cakes. 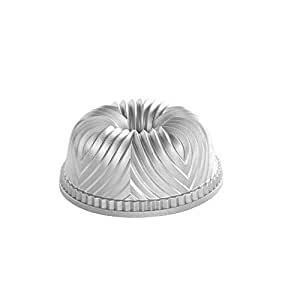 The pan's heat-reflective exterior ensures the cakes will be uniformly browned. 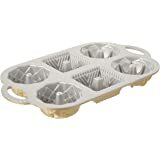 It's also perfect for molding salads and chilled desserts. 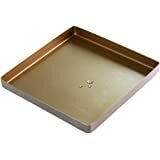 The interior is coated with durable nonstick to ensure fluting details remain when food is released and to provide for easy hand washing in soapy water. 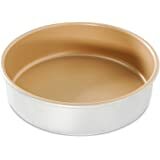 The pan measures 9 inches in diameter and holds 10 to 12 cups. Exceptionally durable, it carries a 20-year warranty against defects. 5.0 out of 5 starsEasy to use and a show stopper! 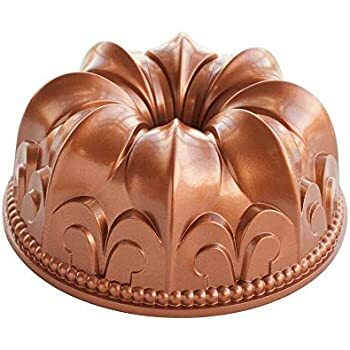 An excellent bundt cake pan! It comes out beautifully and is the perfect size. This is a ten cup pan. Originally I thought it was going to be too small, but after baking in it a few times I think it's just right. There's plenty for everyone! The presentation is just beautiful and I haven't had a cake break on me yet. I butter and flour the pan with a silicone brush, this technique seems to be the best.. I have sprayed with several oils even special baking oils however the butter and flour technique seems to be the most consistent method of getting the cake out in one piece. I use a plate to invert the cake out, works every time. these molds just arrived yesterday - they are simply beautiful! 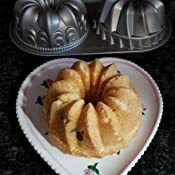 i could not resist trying them out, so i made a tasty vanilla and chocolate marble cake from an old family favorite recipe. the recipe made enough for these molds and for another small mold that i own (what's not to love-3 pretty little cakes!) the pan does come with a recipe for the exact amount of batter for these cakes, if you don't want leftover batter for another pan, which i will try at a later time, but we just needed a little chocolate yesterday! 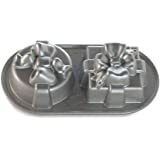 i own several of nordic ware's molds/pans and i do love their quality products. 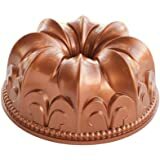 the cakes come out perfectly every time (i use baker's joy or pam for baking for easy release). 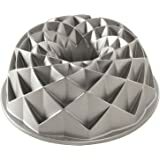 i highly recommend this product for someone who just wants to bake impressive, beautiful cakes for two. Stunning design. The pan has crisp, precise details. Fill it to where the "dirt" layer starts, that's the 2/3 mark. 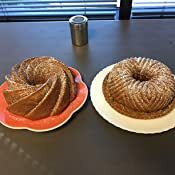 I always freeze my bundt pans before baking so the cake doesn't dome as much. It still domed a little anyway, and I was tempted to slice off the excess, but it ended up shrinking down. 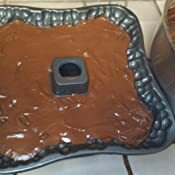 Because of the slight doming, the bottom of the cake does not sit flush with the cake board- but no problem! I filled in the gap between the edge of the cake and cakeboard with whipped cream. The cake always releases easily with Wilton's Cake Release. Nice made pan, sturdy and well made. Be warned though, it is somewhat small given it is a 10 cup pan. 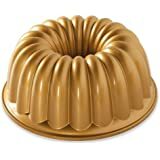 I just made a Rum cake in it using a normal size Yellow Dunkin Hines cake mix and a box of instant vanilla pudding+ 4 eggs etc. The pan had all it wanted and did a nice job. 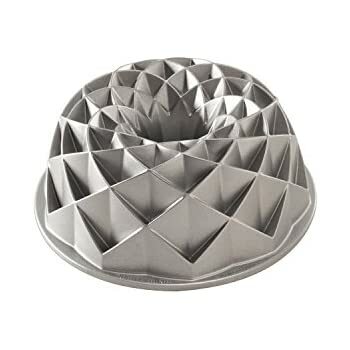 But if you go with a bigger cake like a recipe from scratch you might want to rethink buying this pan. 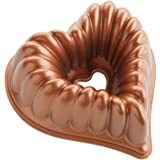 But for just a normal size boxed cake off the shelf you will be fine. 5.0 out of 5 starsSmall, but nice. Clean. Not dusty with dents, dings, or defects. Heavy weight. Wish there were 'handles', but there are none per se. You CAN get a fairly decent grip on the metal in the middle between the 'molds', and lift it out of the oven that way, but it's not a true handle. The lack of handles however does not put me 'off' this pan. I like it. I did bake 2 cakes and yep, they both stuck to the top of the pan. 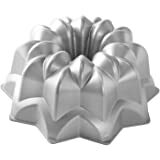 HOWEVER, I did not make my 'usual' recipe and I didn't prepare the pan as I do with my large Nordic Ware Bundt pan. This time, I sprayed "Pam" and coated with flour. On my larger pan, I use butter, not cooking spray. No problems with release when I use the butter in my big pan. I DO believe preparation of the batter, ingredients, preparation of the pan, etc. can make cakes do different things. So I will try again, using my usual recipe with my usual preparation (butter & flour). I made the recipe that was included with the duet pan. It was delicious, but made too much batter. This pan holds == 5 cups == total, not 6. I measured with water in a measuring cup, and each side will hold a total of 2 1/2 cups. But that's if you bring it up to the very tip top of the pan. Almost overflowing. 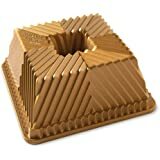 COMFORTABLY, you should put 2 cups in each side to give a bit of room at the top for expansion of the cakes. So it really holds == 4 cups == properly. Another mistake I made was trying to get every little bit of that batter into the pan. Hence, it was right at the top of the pan, and overflowed. I also think I overbeat the batter. So, my mistakes all around. I still love everything about the pan so far. And again, I will rebake properly, and update. UPDATE: 10/21/13 - Baked my "usual" recipe in this pan. Made 2 bakings. The 1st batch, I filled to where I thought I would have enough space at the top for the cake to expand/rise. (About 1/2 inch from the top). It STILL came out a bit too high and puffed up. So you really have to put a lot less in this pan than you thought. On the second batch I left a full inch at the top. (I stopped filling it up a full inch from the top rim).SO PROBABLY 1 1/2 TO 1 3/4 CUPS IN EACH SIDE). IT came out fine then. They are a little shorter than I'd like appearance wise, but tasted delicious. As it turns out, it's such a dense pound cake, even these small ones are filling. Contrary to other comments on the web, I had NO problems with holding my batter in the refrigerator covered with plastic, while the first batch cooked. 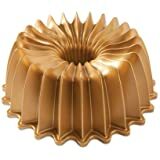 These are so small and cook so much quicker than a large bundt pan, the batter didn't fall or over rise while waiting. It was perfect both times. Also, I decided to deviate from my usual butter/flour pan preparation. I used Alton Browns formula for coating pans. (Kustom Kitchen Lube-2 cups Crisco & 1 1/2 cups AP flour, blended well with a mixer). Spread that liberally into each pan. NO sticking whatsoever. Dropped right out of the pan. So I don't know if this is better than my "butter" method or if I just got lucky. Either way, the cakes came out delicious. This pan was the least $, I wondered why; the descriptions are almost identical. 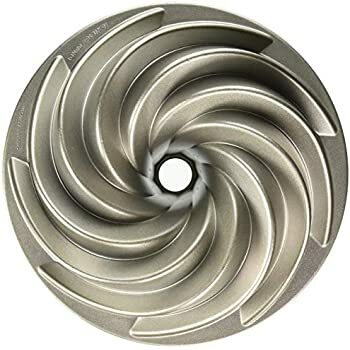 This product has burrs on inside surface of the pan , some fell off just by touching with fingernail. I sure wouldn't want these in my stomach. I'm thinking these are lower price because they are seconds. 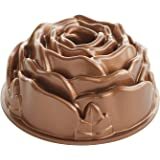 I have used this pan twice already, and the cakes were beautiful, almost too pretty to eat. 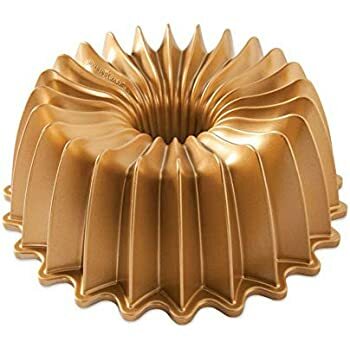 I have two other Nordicware pans. I love them. 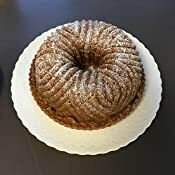 The trick for perfect cake release - melt butter and use a silicone pastry brush to ensure the melted butter is spread in all of the crevices, up to the rim, even if the recipe recommends flour based oil spray. Then dust very well with flour. My cakes literally "slip out" every time. Also, just follow the manufacturer recommendations to achieve longevity.